Knowledge, expertise, and experience matters in everything we want to do at mastery level. Dentistry and dental implants are certainly no exception. But how does our current dental implant training courses and educational system live up to this challenge and do they provide the type of engagement required for best delivery of care? As an oral and maxillofacial surgeon, I have been placing dental implants for 25 years. I have devoted my life to understanding its biology, dental materials, and techniques. Here is a secret: If anyone tells you that dental implant placement is simple, I can assure you it is not! I’ve treated hundreds of patients with dental implant complications who were told by their dentist that their case was “easy”! It really is not their dentist’s fault either. Dentists are told by some implant companies and educators that placing dental implants is simple and easy and that they can do it themselves. 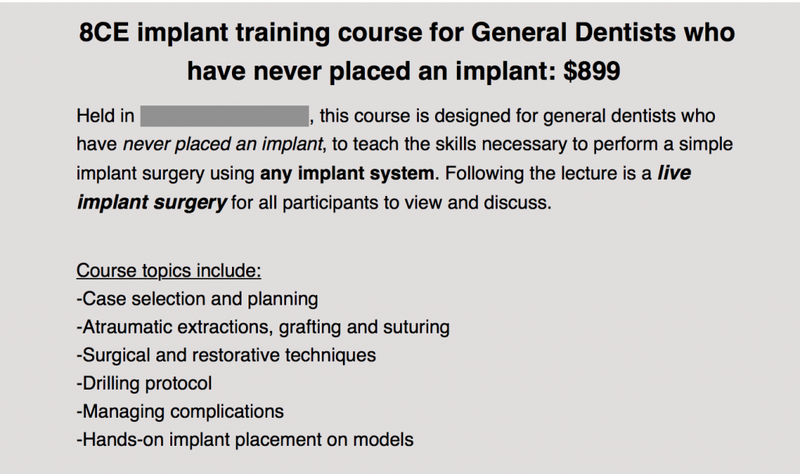 An online marketing email I received recently said: “8-hour implant training course for general dentists who have never placed an implant.” The course claims to teach the “skills necessary to perform a simple implant surgery,” and the only experience required is the placement of implants on models! And that is not all! Dentists are also promised to learn extraction, grafting, suturing techniques, drilling method, restorative techniques, and managing complications- all within the same 8-hour course. Is that even possible? I appreciate education at every level. But this simply sounds too good to be true. The real problem is that people are not models! Real bone is not the same as a stone model. Furthermore, models don’t have feelings, work and family commitments, and don’t have to pay for the service—and patients expect good results in return for their investment. A typical implant specialist, whether an oral surgeon or a periodontist, spends 3-4 years of specialized training on surgical management of tissue and implant placement. The procedure itself involves dozens of anatomical, biological, and technical principles that must be deeply understood to achieve desired outcomes. Then it takes years of additional education, practice, and experience to master it. 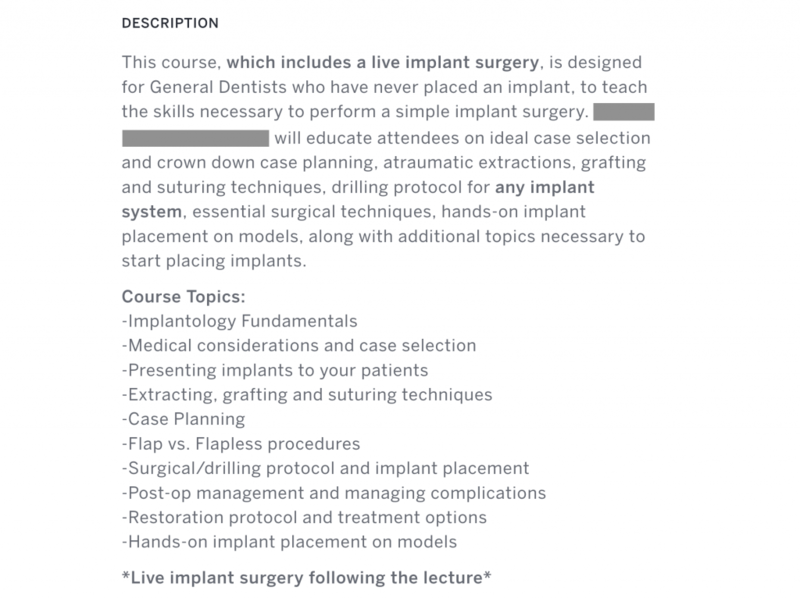 To imply, as this course advertisement says, that a general dentist can successfully place an implant after 8 hours of watching slides and drilling a hole in a stone model is nothing less than a dangerous lie. No patient ever goes to a doctor, whether a dentist or a physician, expecting to be a subject of practice or a training unless it is clearly disclosed to them. Patients take time out of their lives and invest their hard-earned money with the assumption that they will be getting the right treatment and expected results by some one who is qualified. Unfortunately, there are no current guidelines or parameters by the state licensing boards to regulate the practice of implant dentistry. Hence, any dentist can do any procedure they choose, regardless of their training, skills, or knowledge. A beautifully-framed certificate of completion of an 8-hour course proudly displayed in a dentist’s reception room is often misinterpreted by patients as a qualifying proof. First, how can patients qualify dentists for placement of their dental implants? If your dentist is an oral surgeon, a periodontist, a general dentist, or a prosthodontist with formal training and experience, you are half way there. Make sure to ask about specific areas of expertise and if implant dentistry is in-fact their main focus. If you see a general dentist and demonstrates various certifications in implant dentistry, ask about the extent and scope of their training. How many days were the courses? Was the course over a 1-2 year dedicated formal implant training course as a fellowship or given during several weekends over the same period? How many actual patients have they treated? Ask if their work quality is same as that of a specialist? Ask to see before & afters. Remember that certifications do not mean much without exploring the education behind them. How can we, as professionals, do what is right for our patients? The solution lies in every dentist, whether general or specialist, taking the personal responsibility to make decisions based not on financial gains, but on doing what is right for their patients’ well-being. The solution lies in every patient asking the right questions when qualifying their dentist for such procedures so they are engaged in the decision-making process. The solution lies in professional educators and implant companies not misleading dentists into believing that they can do highly complicated procedures (yes, the placement of a dental implant is very complicated) just to sell a course or a bunch of dental implants. We all must get beyond “what’s in it for me” and think about why we do what we do and then do what is in the best interest of our patients who put their trust and confidence in us. We must embrace the general dentists and the prosthodontists and tell the truth about what it takes to learn and master such surgical procedures and openly offer them educational opportunities that are real, deep, and comprehensive with proper mentorship and collaboration. If any dentist wants to place their own implants, I think they should and they can- as long as they have made the commitment to learning how to do it the right way and have invested the time and dedication necessary to develop the same knowledge and skills as the specialists. We must open lines of communication, collaboration, and education. Surgical specialists must learn more about restorative disciplines as general dentists and prosthodontists must further their understand of surgical principles. We must establish cross-platform education provided in a comprehensive, transparent, and responsible way for benefit of our patients. Dr. H. Ryan Kazemi is a board-certified oral and maxillofacial surgeon in Bethesda, MD. This entry was posted in Dental Implants and tagged dental implant courses, dental implant experience, dental implant training. Bookmark the permalink.